The PUNCH PAD is a two sided wall pad. One side has a series of octagonal targets. The reverse side has a series of body shapes. 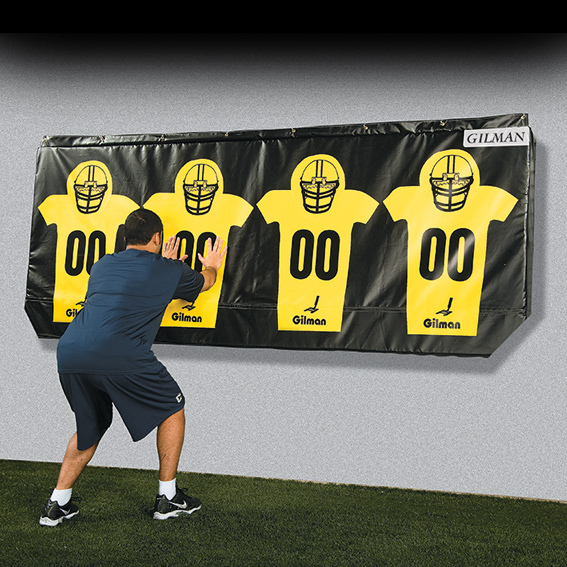 The pad offers a visual target to teach the concept of delivering a blow with tight hands. Use this pad to coordinate the pass set, the footwork, and the punch for both inside and outside defenders. Take power steps with proper posture and balance and then time up a powerful punch. Great workout tool during non padded practices! Use it indoors during off-season conditioning workouts. Easy to hang using pre-set grommet locations along the top border. High density 9" thick foam makes the pad stand up to repeated pounding. Available in two lengths: 9' and 18' long. "The coaching point is to strike with proper hand placement and posture!"